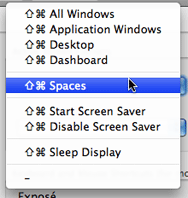 OS X has a trifecta of what I call “screen-modifying” features—Exposé, Dashboard, and Spaces—that are controlled by the aptly-named Exposé & Spaces System Preferences panel (Dashboard, alas, doesn’t get a shout out in the panel name). Using this panel, you can control how these various screen-modifying modes are activated—using function keys or mouse buttons. You’re probably aware that you can add modifier keys to the activation keystrokes for these features. Hold down any/all of Shift, Command, Option, or Control while setting their activation keys, and the active modifier keys will show up next to the activation keystroke. For example, hold down Shift and Control, then select the All Windows pop-up for Exposé, and you’ll see small Shift (up arrow) and Control (carat) indicators in front of the various All Windows activation keys. This isn’t a hint per se, because Apple documents it in the small text that appears above those sections of the Exposé & Spaces System Preferences panel (“for more shortcut choices, press Shift, Control, Option, or Command”). What does seem like a hint is the fact that these modifier keys can also be added to the Active Screen Corners section of the Exposé tab on the Exposé & Spaces System Preferences panel. Click the top left menu in that section to define what action you’d like to occur in the top left corner of the screen, and then hold down the Shift and Command keys, for instance. With the pop-up menu active, you’ll see that each option is displayed with the Shift key’s arrow indicator, and the funky Command-key graphic, as seen in the image at left. Unlike the panels for Exposé, Dashboard, and Spaces, there’s no explanatory text for the Active Screen Corners section of the preferences panel that would let you think this possible, but it seems to work just fine. I know this works in OS X 10.5, and I believe (but can’t test) that it also works in OS X 10.4.